Businesses looking to hire a window cleaning service will often solicit bids from several companies before choosing a vendor. At times all of the submitted proposals will look similar while at other times, the numbers may be all over the place. It helps to know just how contractors set their commercial window cleaning prices when you're trying to make sense of a dozen proposals. There are several ways to bid for contracts listed below. Some companies and individuals set their commercial window cleaning prices based on a per-pane basis. That means they will charge you a set rate for every pane in your building, possibly with different charges based on the actual size of the windows. Double hung windows would be considered two panes and charged accordingly. The per-pane method is very useful to the contractor when bidding store fronts or other simple layouts. It's easy and pretty straight forward. For large office buildings or areas where local law limits the number of windows per square metre, commercial window cleaning prices can be set according to the total floor space of the building. This eliminates the need to measure individual windows or look at building blueprints. If your building's total footprint was 30,000 square metres per floor, with two floors, your price would be based on 60,000 square metres of floor space. This system can be advantageous for buildings with higher window counts. The opposite is true for those with low window counts. Different window cleaners view some kinds of windows as inherently more difficult to clean than others. A clothing shop display window, for example, may be priced higher because cleaning the interior requires working cautiously around the items displayed in the window. Glass paned doors might be priced inexpensively because they can be cleaned very rapidly and without much effort. Height, position, and ease of access all play a role in this pricing method. If a company offers this type of proposal make sure he specifies his exact charges for each style of window and how many he has counted in your building. Pricing based on this method needs to be very specific to avoid future confusion. 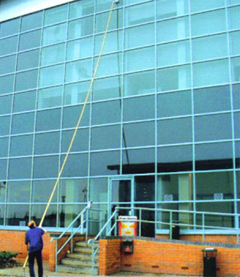 As with any business, commercial window cleaning prices have to be established which take into account every cost accrued in getting the job done. A window cleaning contractor will most often determine commercial window cleaning prices by visiting the job site and doing a thorough inspection. He will estimate the total number of man-hours needed to complete the job as well as materials, travel time, and any special circumstances that could add to the job's difficulty. He will then set a price that will cover all his expenses and still put some extra in his pocket. Any proposals you accept should list more than just the commercial window cleaning prices. They should also specify frequency of the service calls, general guidelines regarding weather-related issues, any special equipment used, who will be responsible for liability issues, and whether there is recourse for unsatisfactory work once the contact has been signed. It's also a good idea to make sure the proposal stipulates how often a contact is renewed and if a contract renewal also requires a new bid price.